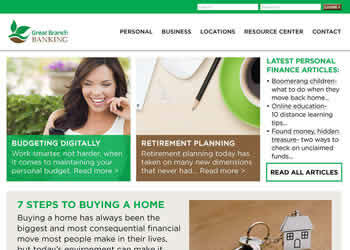 What better way to engage current bank customers and attract new ones than to offer a one-stop resource center on your bank's website? SBR Web solutions, in combination with our E-Newsletters and Social Media Tools, make for an unbeatable marketing mix. We can design and manage your online Resource Center or - if you prefer - deliver proprietary content for your bank to customize. SBR's Business Resource Center is a one-stop solution for business owners with no time to spare for Internet searches. Keeping customers on your bank's website not only guarantees they get the right information, it also gives your bank the opportunity to cross-sell valuable products and services. SBR's Consumer Resource Center provides personal banking customers all the information they need to effectively manage finances throughout their lifetimes. The user-friendly content will keep them on your site, making it easy to access your bank’s products and services. SBR Financial Wisdom Website contains the library of over 300 articles ranging from consumers, young adults and small businesses. You have the option of having the website built with your colors and fonts. We can also provide you with the content in numerous formats for your use in placing directly on your website or social media and eNewsletters.